2- When the pressure and repression gets too much, it will be a source of explosion. Social explosions are like mechanical explosions which the explosion happens at a specific pressure. In fact the spreading of corruption by the oppressors of the time makes the revolution closer. As a result, they water the seeds of the revolution until the crisis reaches its climax and the revolution occurs. Of course, it should be noted that spreading of corruption is not enough, but also increase of the awareness in this field is necessary. The purpose of raising awareness is that men realize their position and value and they consider toleration of oppression and corruption as living a shameful and deadly life that is not appropriate for human dignity. Then, by evaluating their condition and facilities and the oppression of arrogant powers, they sow the seed of revolution in prepared lands and try to water it in different ways. Needless to say, as long as the public do not get such awareness and people are not aware of their values and they don’t evaluate their own and others facilities, there will be a blind revolution which cannot guarantee people’s benefits. In other words, for the realization of a revolution, the spread of corruption or existence of a competent leader is not enough, but in addition to this, it is necessary to have spiritual and intellectual preparation so that people pay the cost of revolution, which is sacrifice and martyrdom for the goal at the right time. Otherwise, lethargy, laziness and satisfaction with the current situation, resides in the spirit of the society and the idea of revolution won’t come to their minds and with sticking to sentences like “anyone should care for his own, “other peoples are not my concern“ and etc., they prefer the current situation which is combined with a kind of indolence over the uprising and revolution and enduring of imprisonment, torture, murder and death . Moreover, for the realization of the uprising of Imam Mahdi (PBUH), there has to be a prepared army and an efficient Task Force to support Imam (PBUH) and to obey his commands. So, in this hell of oppression, corruption and discrimination, some devoted people have to grow to be the messenger of justice spring. This group should be equipped with the power of faith and piety, and they should be devotee. Briefly, if the spreading of corruption and oppression results in “Enzelam” –acceptance of oppression and tyranny-it will never be a factor of an uprising against it. It can only be useful when it is a preface for a battle in order to achieve justice and goodness. Obviously, this preface shall never realize unless people know the badness of oppression and on the other hand they also recognize the symbols of individual and social righteousness and piety and the only way for this recognition is invitation of people to righteousness and piety. 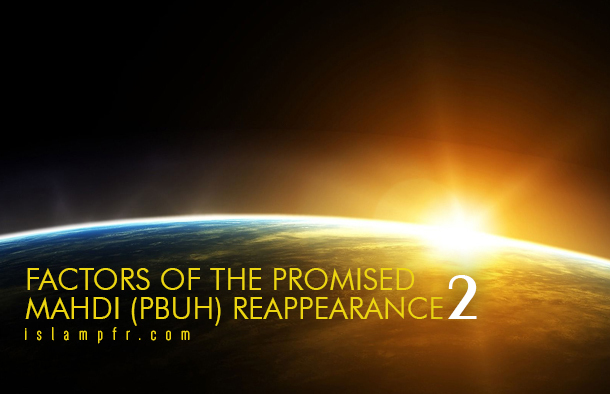 There are several hadiths which say that several groups at different times pave the way of the reappearance by reforming movements in human societies .These hadiths are gathered in some books . Scholars of the past have written several books about duties and tasks of the awaiting people in the occultation era or they dedicated some chapters of their books to this issue such as “Al-Najm Al-Sagheb” written by Ayatollah Allameh Mohaddith Nouri (D. 1948), two books of “Mekyal al Makarem” and “Duties of people in the occultation time of Imam Mahdi (PBUH)” written by Ayatollah Musavi Isfahani (D. 1969). In these books and other books like them, reappearance factors and the duties of the awaiting people are mentioned only based on the narrations of the holy Imams. 1- The intellectual and cultural preparation: The intellectual level of the world public should get so high to know that for example, “race” or “different geographical areas” are not significant issues in human life and the difference in colors, language and countries can’t separate mankind from each other. 2- Social preparation: the people of the world must get tired of oppression and existing governments, they must feel the bitterness of this material and one dimensional life and even they have to get disappointed from the possibility of solving current problems in future with continuing this one-dimensional way. 4- Individual preparation: First of all, the global governance needs elements with high humanistic values and preparation to bear the burden of such widespread reforms. It should be noted that it’s been a long time that the corruption has covered the world. The corruption of superpowers has reached its climax in many areas of the world and particularly Africa and Asia. From the day the West developed the idea of dominating over the East, it has added to its oppression every day in different parts of the world and has fettered millions of people. Checking the condition of colonized countries of Africa and South Asia is an illustrative and clear proof of this issue.